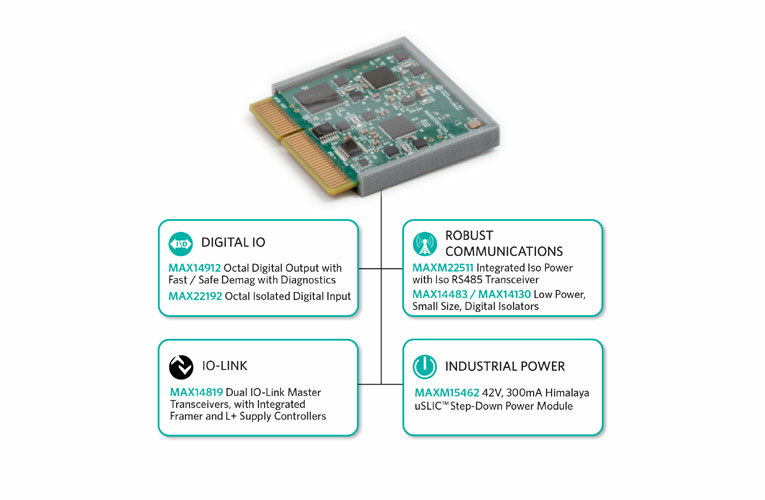 In order to meet the size, power and performance requirements of Industry 4.0 applications, Maxim Integrated introduced an expanded family of digital input devices. One of the new devices, MAX22192 is integrated into the company’s Go-IO programmable logic controller (PLC) reference design. The expanded portfolio of IEC61131-2-compliant digital input devices offers a small solution size, features the lower power dissipation, is up to 6x faster and has robust performance (integrating 1kV of surge protection and integrated diagnostics). Moreover, they also include a parasitically powered digital input that reduces power dissipation and does not require a discrete isolated power supply. These products enhance a digital IO family that also includes theMAX14912 and MAX14913 octal high-speed, switch/push-pull driver with integrated surge protection, diagnostics and fast/safe demagnetization; the MAX14914 universal digital IO with surge protection, high-side switch/push-pull driver/digital input and an SPI interface; and the MAX14483 6-channel, high-density, high-speed, low-power digital isolator optimized for daisy chained SPI applications. The MAX22190, MAX22191, MAX22192 and MAX22195 are available at Maxim’s website for $2.73, $0.57, $5.22 and $2.20, respectively (1000-up, FOB USA); they are also available from authorized distributors.